One of several Robert Trent Jones designs that are strung out along the Costa del Sol, Mijas is a marvelous golf complex offering two wonderfully contrasting 18-hole courses. Los Lagos was first to open in 1976 and it is set in 150 acres of a gently undulating landscape with wide, open fairways, huge greens and several large lakes that feature at half the holes on the scorecard. 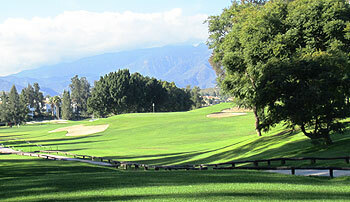 In contrast – and by way of complementing the Los Lagos layout – Los Olivos was opened in 1984 as a shorter, tighter 18-hole course routed over more hilly terrain. Cabell B. Robinson, an old associate of RTJ, remodeled the 18 holes during the 2000-1 season. 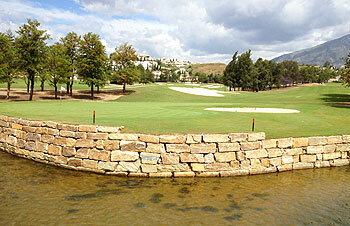 Los Lagos has many memorable holes and a contender for the best of these is the 617-yard, par five, stroke index 1, 5th where the fairway is restricted by a boundary wall all the way down the left. The hole narrows to a large waste bunker on the left at the landing area with water further along on the right, in advance of the offset green – risk/reward golf at its very best. Whilst this is a 'nice' course - I am surprised it is so much higher than Torrequebrada. It is very open - which helps - but it is very long - hitting the greens in regulation is a tough ask at times becuase the greens are also pretty small for a resort course. It was a pleasure to play and the buggies were allowed on the fairways and had GPS - although it was at times a little inconsistent with its estimations! Also the 'pro tip' for each hole was 'A Narrow Drive' - which is not often the case on the course to be honest. The closing hole is a lovely sweeping uphill par 4 to the clubhouse and in Sept the swallows are swooping low across the fairway in a quite spectacular sight of acrobatics. Its a nice course but fairly innocuous compared to the other two we played. The fairways and surrounds of the green were also very wet and to be honest 'pick and place' would not have been unexpected - they must have been watering the place for a day before we arrived. Lovely little clubhouse with loads of charm.